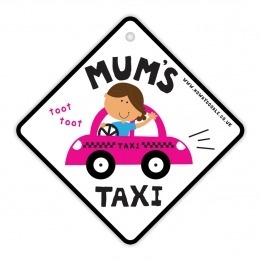 Do You Feel Like You Are Your Childrens Taxi Service? Do you feel like you’re a taxi service to your children? I don’t quite feel like I’m a taxi service for my boys yet, but I’m sure in a few years I will. Just now I mainly walk with them to school, unless it’s pouring or I’m going straight out after dropping them off, it’s less than a 10 minute walk and by the time I get the boys and the baby, plus school bags and everything else piled into the car, I’d be there already. When my youngest boy, Tyler, was at nursery I had to take the car to drop him off and pick up both oldest, Lucas, from school and Tyler from nursery as the time constraints were an issue. Now they are both at the one school I don’t have the same issues. After school Lucas has football on a Wednesday evening, his dad takes him to this as he is one of the coaches. Tyler is too young for this, but come next year they will both be there. Then the next evening both boys go to a club at the church, again another car journey there and back and back to get them. The next evening Lucas has Taekwondo, yet another trip in the car. Saturday is taken up with football matches in the morning which is in another two over 1/2 hour away and then it’s football training for both boys late morning. And yes it’s another car journey. Sundays used to be Taekwondo, but it’s now Sunday club. Activities and crafts for both boys. They may only be 6 and 4, but they have a pretty good social life. I know it’s not too bad just now, but as they get older there will be more football training, more nights at Taekwondo, once he’s above green belt he has to go to at least 2 classes a week. He’s on yellow belt green tags at present. Lucas would also like to take up tennis and golf. More money and more hours spent in the car, travelling, waiting and picking them up. These haven’t even taken into account birthday parties, trips to friends houses, etc, etc. As they get older, I will still want to ferry them about, I don’t want them getting into any unnecessary danger with walking late at night or getting on numerous buses if their dad of myself can easily pick them up. It means I know where they are and I know they are safe. Over protective, maybe, but I think it’ll help me feel more at ease if nothing else. Research done by Home and Car Insurance provider Allianz Your Cover shows that the average family taxi service is worth around £7,813 a year, driving around 1,700 miles and that us parents spend around 4 days a year waiting for our children in the car. I don’t think I’m quite there yet, but I envision about that in future. Especially when Allianz Your Cover’s research suggests that I’ll be ferrying my children about until they pass their driving test and then afford a car or until they leave home. Maybe even until they are into their 30’s, some even suggest it never stops. Do you ferry your children around? What do you expect in return? Help around the house? Money towards fuel or just a simple thank you? Do you have any tips for making the taxi service journey any easier? My top tip would be to keep some water and some snacks in the car, you never know when you might hit a traffic jam. I expect to be a taxi service for all three of my children for many years to come and I’m going to love it. Equipped with my iPad mini for reading my kindle on or catching up on social media, etc, I’m good to go. At the end of the trip a ‘thank you mum’ is all I’m looking for. Disclaimer – This article has been written in association with Allianz Your Cover Insurance, for which I have been compensated but the words are my own. Please see my disclosure policy for further details.